Even thought we don’t get a lot of rain in Colorado Springs, gutter repair skills can come in handy to keep your home in tip-top shape. If you’re a do-it-yourselfer then you’ll like the tips below designed to keep your gutters in good condition and your home (and foundation) dry with a nice gutter repair. The role of gutters and downspouts is to channel off rainwater from your home in a safe, controlled fashion. Without proper guttering, rain will run off your roof directly to the ground. This can cause erosion, stain the side of your building, and lead to significant structural problems down the road. If water is allowed to collect against your building’s foundation, it will eventually compromise the integrity of the structure and the foundation and eventually enter the home. When rainwater enters your home, major damage will happen. 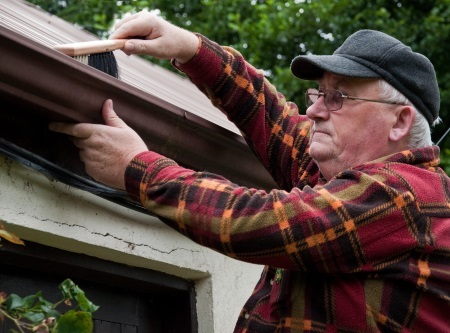 To avoid these problems, you need to make sure your gutters are always in good working order. Besides cleaning out your gutters, you also need to be ready to handle some basic gutter repair jobs. We’ll cover three of the most common ones here. Being able to fix these issues in a timely manner will dramatically extend the useful life of your gutters and save you plenty of money in the long run. Regardless of how a hole was punched in your gutter, fixing it quickly is important. Water will quickly erode any hole and make the problem even worse. Make sure you patch holes in your gutter with the same material they’re made out of. Bringing two different metals together can cause electrolytic corrosion, weakening one or both of the metals involved. Your patch should be sized to overlap the hole in your gutter by several inches. The gutter needs to be as clean as possible before patching. Use a wire brush with stiff bristles to remove any smaller debris before attaching the patch with roofing cement. Use aviation snips to trim out any rust around the hole prior to patching it. Admittedly, this is one of the more difficult gutter repairs. The joints are where two pieces of gutter material meet and are the weak spots in your gutter system. Even so-called “seamless” gutters still have similar problems at corners and downspout connections. The same repair methods work well on leaks whether they’re located at a corner or in the middle of your gutter. One of the more efficient ways to patch gutter joint leaks is to use a high-quality water proof caulk. I personally like the pure silicone caulk best. Use it liberally on the inside of the gutter, making sure your gutter is absolutely dry before you apply the caulk. Give the caulk plenty of time to dry or to cure, then wait for the next storm (or spray some water onto your roof with a garden hose) to test your work. No leaks – that’s a great thing, you did a good job patching your gutter! Gutters are supported by spikes that connect them to rounded sleeves called ferrules. Over time, these spikes can work themselves loose, causing your gutters to sag. If enough spikes fail in the same area your gutters can even fall off entirely! Long screws (usually around seven inches) designed specifically for use with gutters are the proper replacement for missing spikes. You can normally pick these spikes up at your nearest Home Depot or Lowe’s in the roofing department. It’s possible that the wood behind your gutters is rotted, in that case the new spikes won’t do you much good as you’ll have to replace the wood first. If you have some gutter problems but just don’t have the time to make the repairs, why don’t you give us a call or use the handy form at the right to get a free estimate? Chances are we can come in and make the necessary gutter repairs and save you the money on a new gutter system.